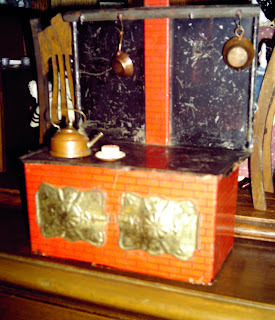 Just found this wonderful doll-sized chamber set, dating from the late 1800s - early 1900s. 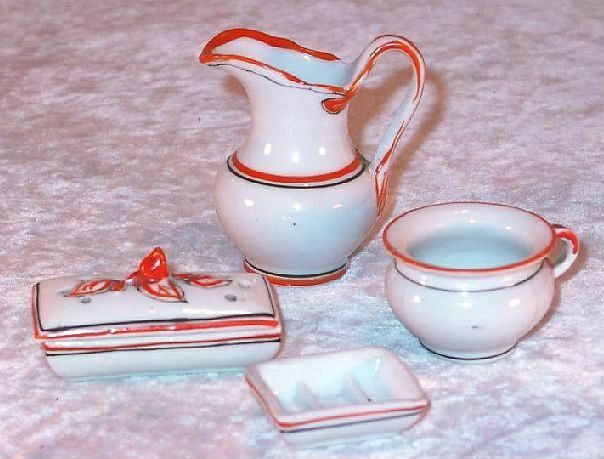 Includes a pitcher (4 inches tall), chamber pot, soap dish, and toothbrush holder. 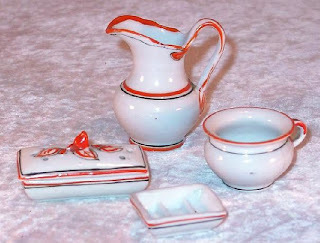 The porcelain appears to be handpainted, and the set was probably made in Germany. 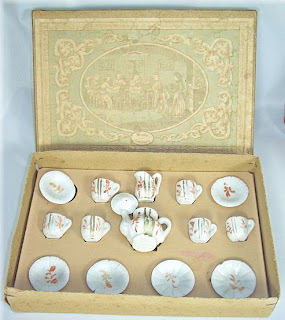 Along with the larger doll-sized dinner dishes shown in the post below, I found this wonderful miniature tea set, still in its original box. Made in Germany around 1880, these sets were churned out rapidly and are consequently rather crude, but still quite charming. Sized for small dolls or children's play, the set includes 6 cups and saucers along with a teapot and creamer. 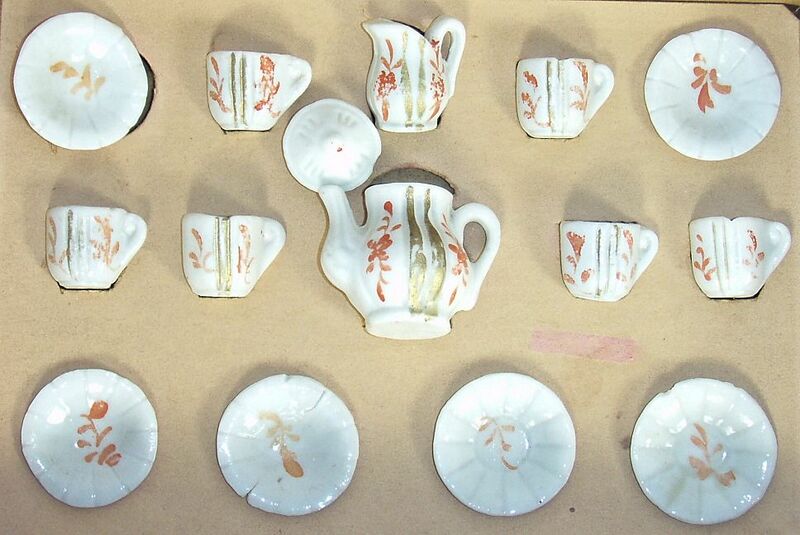 Each teacup is 1 inch tall. 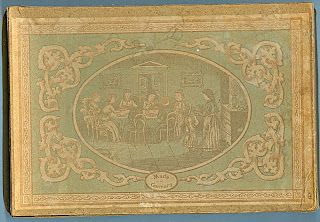 The box lid, though faded with age, still bears its original lithographed label portraying little girls at a tea party. This tiny carved wooden kitchen in a matchbox measures just 2 1/4 inches wide. It was made in Germany circa the 1920s, and features a lithographed label and interior background. 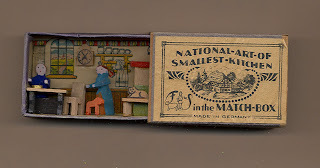 It was part of a series of similar matchbox dioramas including butcher shops, apothecaries, butcher shops, sewing rooms, and more. It's so tiny and delicate, it's amazing to see how well it has survived these many years. 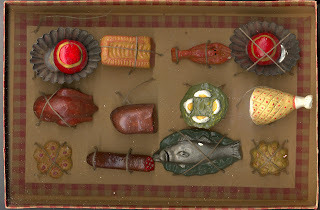 These two sets of French or German-made dolly food date from the late 1800s - early 1900s. They're made of hand-painted plaster, and the largest pieces measure about 2 1/2 inches across. They're a bit large for most dollhouses; perhaps they were meant for toy kitchens or doll play. These pieces are wonderful on their own, but what makes them even more special is that most are still tied down with twine in their original packages. 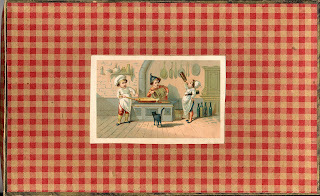 The boxes themselves are quite beautifully lithographed with scenes of children cooking and eating. It's always especially exciting to discover such a fragile old toy that has survived in this condition: these were one of my greatest finds ever! 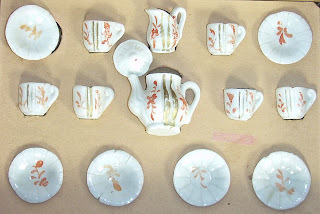 Here's one of my favorite children's tea sets: a Googly character set from the early 1920s. 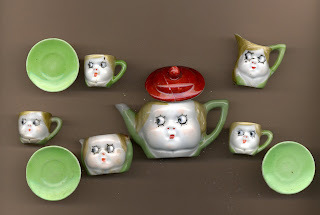 Googly eyes were a popular motif on toys at that time, appearing on dolls, in illustrations, and on this little tea set, which was made in Japan. The teapot is about 2 1/4 inches tall with the lid, and is marked Nippon on the bottom, while the cups are each 3/4 of an inch tall. This was my first antique doll: a 13 inch Floradora by Armand Marseille, made in Germany in the late 1800s or very early 1900s. She's a special one because she's unplayed with, and still wears her factory-original undergarments, shift, socks, and felt booties. She would have been sold this way, and her first little owner would have made her dresses, probably with help from mom and grandma. This Flora has a beautifully done bisque shoulder-plate head with stationary, painted blue glass eyes and her original human hair wig, on a cloth, rag-doll style body. This large, 19 inch German doll is one of my very favorites. Her bisque socket head has a great chubby face, with a roll of baby fat that makes her adorable. 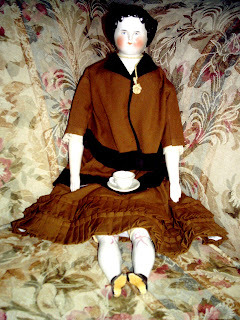 She wears a lovely old doll dress, and has an antique human hair wig that suits her beautifully. 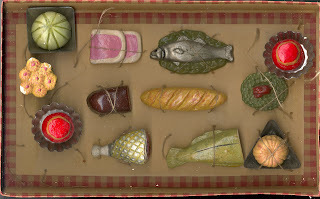 These small immobile dolls are called Frozen Charlottes, and they date from the late 1800s - early 1920s. Sometimes called bathing dolls, they were usually crudely made of china. The tiniest in my collection measures just 1 inch tall, while the largest is 3 1/2. The first doll is atypically made of clay, while the third doll is also unusual, as it appears to be a boy, and has a small thatch of hair and gold painted boots. Frozen Charlottes look great in groups or clustered in arrangements, and also make good dollies for larger dolls to hold. These little German-made china head dollhouse dolls measure about 4 and 5 inches tall, and date from the early 1900s. They were sold unclothed, and little girls were meant to hone their sewing skills by making them dresses. 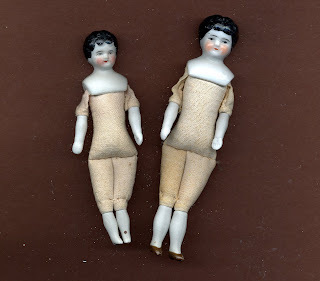 These two came from unsold store stock: they still have their legs delicately stitched together, to prevent breakage from clacking against each other during shipping. 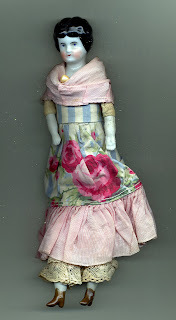 This slightly larger doll wears a lovely ensemble crafted for her by her owner many, many years ago. 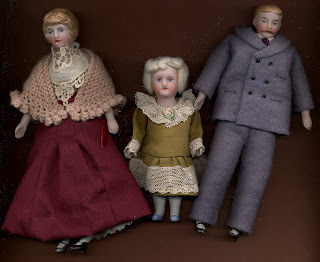 I found this family (and maid) of tiny German bisque dollhouse dolls tucked away in an old candy box, half-buried in a pile of junque in a dealer's showcase. 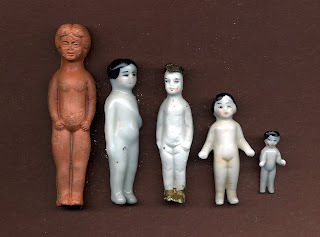 Dating from the 1920s, they measure about 3 1/2 inches tall, with the maid (on the left) being a little bit smaller. 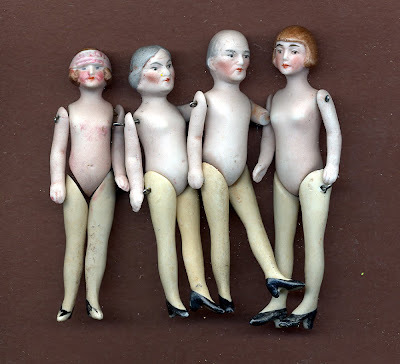 These dolls appear to have been sold naked, although I have seen others that look as if they were factory-dressed. I keep meaning to make them some clothes, but I haven't gotten around to it yet...they've been waiting for 80 years, so hopefully they won't mind waiting a few more. 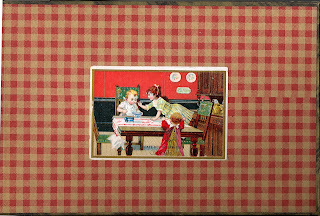 Antique and vintage dollhouse food is one of my favorite toys to collect. Not easy to find, its always especially exciting to come across a type I haven't seen before, or a set in its original box. 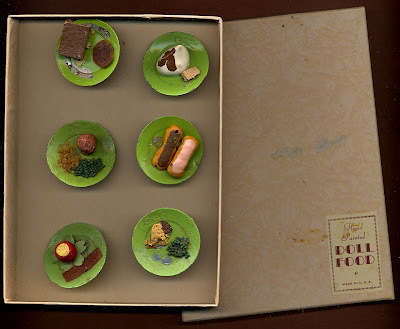 This set, featuring hand-molded food on metal plates, dates to the 1930s. Each plate measures about 1 1/4 inches wide. 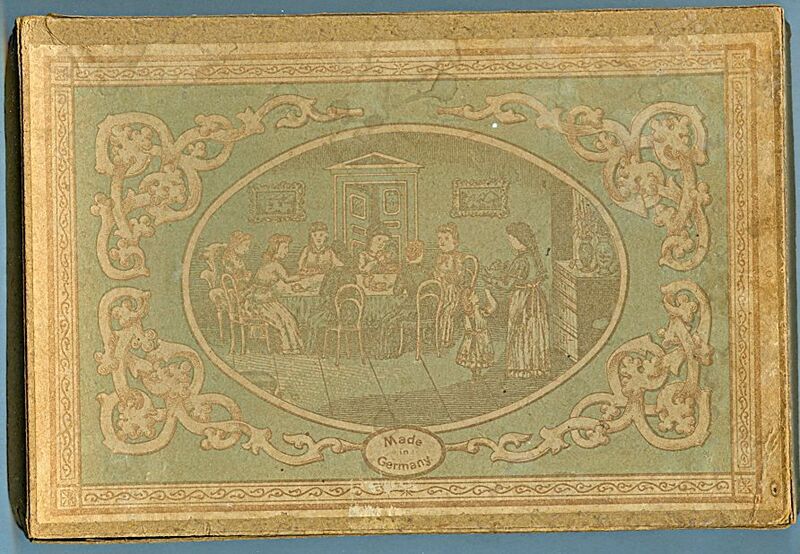 On the back of the box is its original price sticker, $1.50, from the John Wanamaker Department Store. I loved Cracker Jack as a kid. Back in the 1970s, they still put cool prizes in the boxes: tiny pinball games that actually worked, cute little plastic figures that we carried in our pockets and traded with friends, tattoos and glow-in-the-dark stickers, and punch-out scenes to build. But by the late 1980s, new safety standards had been applied and the prizes were hardly fit to be called such. I still buy a box every once in a while, hoping against reason to find something fabulous inside, but I'm always disappointed. As an adult, my love of Cracker Jack prizes was rekindled when I discovered how much better even older prizes were: toy trains, tiny china dolls, itty bitty pieces of furniture, and this, one of the most longed-for antique Cracker Jack prizes on my wish list. Dating from the 1920s, this "Breakfast Set" consists of teeny tiny real glass dishes (a plate, bowl, and cup) along with a metal spoon, all housed in a fragile matchbox. (Talk about safety hazards!) I don't know how excited some small child was to pull this fantastic prize out of her box of Cracker Jack 80 years ago, but I sure was to find it a few months ago! The silver and green stove at the top is American made, and says "Novelty" on the door. It measures 8 1/2 inches wide by 6 inches tall. It's made of cast iron and some kind of metal that has oxidized to a greenish hue, and there appears to be a nickel finish on the doors. This was a wood-burning stove, and it really worked. A fire inside the stove heated the burners on top, and probably the entire stove as well! 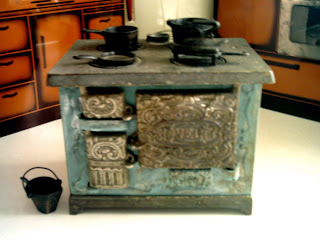 The last stove, also German, is made of sheet metal and is very large, measuring 12 inches wide by 7 inches tall, not counting the stovepipe. This was another working stove, but it heated via alcohol burners (yikes!) which slide out of the stove body . 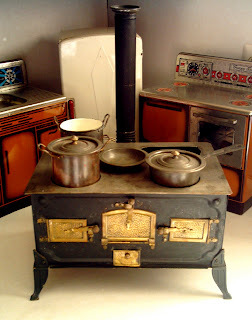 Children actually cooked in the little pans, which are original to this stove.